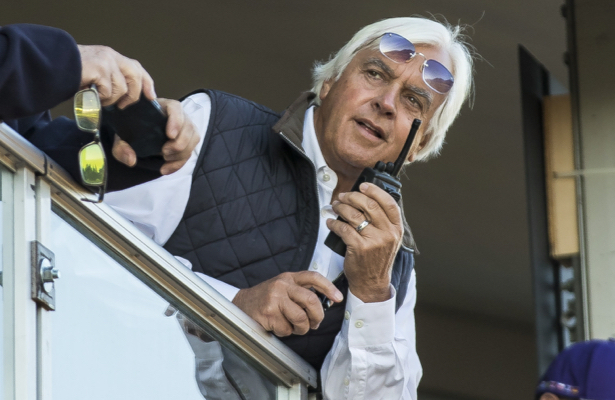 Just before the new year, trainer Bob Baffert said he had no Justify types in the barn — the kind of horse that could come on the scene late and contend in the 2019 Kentucky Derby. “All my good ones have run,” the Hall of Famer ensured at the time. And, yet, Dessman looked pretty good on debut Saturday at Santa Anita Park. Or perhaps he simply didn't face much, as an eye-catching performance delivered just an 80 Beyer Speed Figure. The Florida-bred son of Union Rags broke a step slow from his outside post position in a field of six but moved up quickly under guidance by Flavien Prat. After stalking the pace, Dessman pulled even with Jumpin Thru Hoops midway through the turn, then took control once the pair ran to a half mile in 45.85 seconds. Dessman, under a hand ride, coasted to a 7 1/2-length win while completing six furlongs in 1:11.37. Jumpin Thru Hoops, meanwhile, faded to last. The Baffert barn’s first winner of 2019, Dessman is a $750,000 purchase campaigned by Sheikh Mohammed bin Khalifa al Maktoum. The dam, Frolic’s Appeal, is by Trippi, who ran in the 2000 Kentucky Derby but competed mostly as a sprinter. We’ll learn more about Dessman’s class on Sunday afternoon when his most recent workmate, the 3-year-old Godolphin filly Flor de La Mar, debuts in Santa Anita’s fifth race. Flor de La Mar out-worked Dessman in their Jan. 13 breeze, while back on Jan. 8, Dessman got the better of Kingly, another debut winner and the full brother of Mohaymen, in the morning. A number of stakes options would appear available for a horse like Dessman should he be ready to move up, among them the Feb. 10 San Vicente (G2) at seven furlongs.